O Holy St. Anthony gentlest of Saints, your love for God and charity for His creatures, made you worthy when on earth, to possess miraculous powers. Encouraged by this thought, I implore you to obtain for me (request). 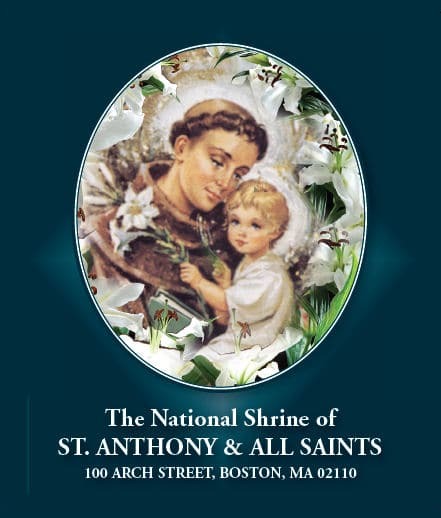 O gentle and loving St. Anthony, whose heart was ever full of human sympathy, whisper my petition into the ears of the sweet Infant Jesus, who loved to be folded in your arms. The gratitude of my heart will ever be yours. St. Anthony, perfect imitator of Jesus, who received from God the special power of restoring lost things, grant that I may find [name the item] which has been lost. At least restore to me peace and tranquility of mind, the loss of which has afflicted me even more than my material loss. To this favor, I ask another of you: that I may always remain in possession of the true good that is God. Let me rather lose all things than lose God, my supreme good. Let me never suffer the loss of my greatest treasure, eternal life with God. When I’m Depressed and in despair, Help me find hope. When I feel alone and forsaken by everyone I know, Help me find love. When I can’t see God anymore in my life or the world, Help me find faith. When I’m afraid of what the future holds, Help me find trust. When I am weak, Help me find courage. When I am sick, Help me find the balm of healing. When I am overcome by grief, Help me find comfort. When I am angry, Help me to find a way to let go. When I’m in trouble and I don’t know what to do, Help me find God. This, we ask of you, through our Lord, Jesus Christ, who reigns forever and ever.